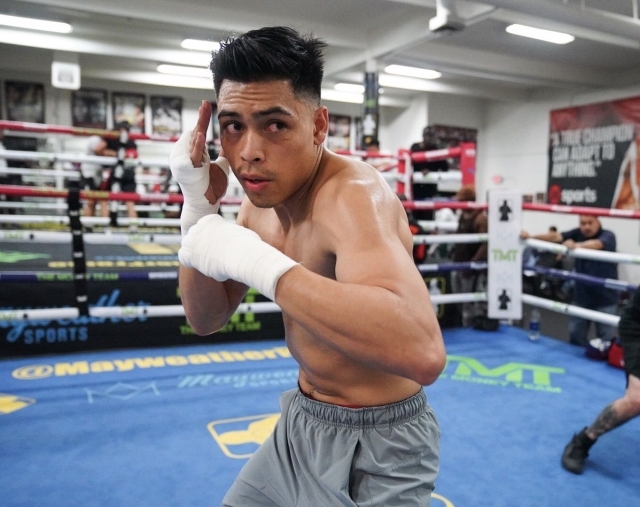 Angelo Leo has no reason to be nervous for his junior featherweight bout on Friday against Neil Tabanao that will headline a ShoBox tripleheader at Sam’s Town in Las Vegas. Yes, it’s Leo’s first main event and televised bout, but he got the jitters out the way two years ago when he spared rising star Gervonta Davis for five rounds with Floyd Mayweather watching ringside. Leo admitted to feeling pressure during the try-out sparring session that eventually earned him a contract to join Mayweather Promotions. Since signing that contract in 2017, Leo has elevated in many areas, from his footwork to ring IQ. He’s now hoping to rise up the 122-pound rankings to land a world title shot in the near future. But first, Leo (16-0, 8 knockouts) needs to get by Tabanao (17-4, 11 KOs), a Filipino boxer who went the distance against former world champion Isaac Dogboe in 2016. The Showtime-televised event airs at 10 p.m. ET. Leo, a 24-year-old from Albuquerque, New Mexico, hasn’t had a bout against a former world champion, but that doesn’t mean he hasn’t been tested. Leo has spared with Jessie Magdaleno, Leo Santa Cruz, Nonito Donaire and Tomoki Kameda, all former world champions. Leo said he makes sure to learn something from every sparring session against elite opposition. From Santa Cruz, he learned defensive tactics. With Magdaleno, he got experience in facing a southpaw with fast hands. But Leo took away the most from one session with Donaire, who has held titles in four weight classes. Leo listened, with Friday’s bout marking his sixth in the past 15 months. Taking advice to improve his craft is what earned him that contract from Mayweather. When Leo spared Davis, he quickly realized that trading punches wasn’t the right approach. Leo has been boxing since the age of 8 and learned the sport from his father, Miguel. He fought six of his first seven professional fights in New Mexico. Leo’s now a regular in Las Vegas. He dreams of one day fighting at the bigger venues on the Strip, but first he’s going to soak in Friday’s spotlight.